The Kwakwaka'wakw continue the practice of potlatch. 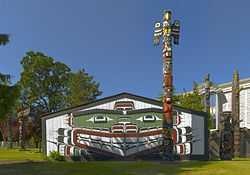 Illustrated here is Wawadit'la in Thunderbird Park, Victoria, BC, (aka Mungo Martin House) a Kwakwaka'wakw "big house" built by Chief Mungo Martin in 1953. Very wealthy, that is, prominent, hosts would have a longhouse specifically for potlatching and for housing guests. A gift economy is a type of economic system in which goods and services are given without any explicit agreement for immediate or future quid pro quo. A gift economy emphasizes social or intangible rewards, such as karma, honor, or loyalty, for giving. In some cases, simultaneous or recursive giving serves to circulate and redistribute valuables within a community. This can be considered a form of reciprocal altruism. Sometimes there is an implicit expectation of the return of comparable goods or services, political support, or the gift being later passed on to a third party. However, in what is considered to be in the true spirit of gift economics, many times giving is done without any expectation of reciprocity. Typically, a gift economy occurs in a culture or subculture whose underlying worldview inclines the people to assume an identity of integral connectedness with both the natural world and other people sharing the same cultural grouping. Gift economies of traditional societies are embedded in social conventions assuring that while individual or personal gain may be an outcome, the exchange also fulfills a purpose that benefits the whole society. The gift economy stands in contrast to a planned economy or a market or barter economy. In a planned economy, goods and services are distributed by explicit command and control rather than informal custom; in barter or market economies, an explicit quid pro quo—an exchange of money or some other commodity—is established before the transaction takes place. In practice, most human societies blend elements of all of these, in varying degrees. Sharing of food in a hunter-gatherer society, where sharing is a safeguard against failure of any individual's daily foraging. 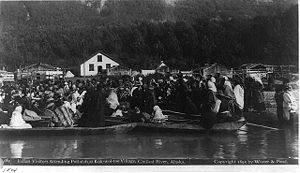 The Northwest Coast Indians' potlatch ritual, where leaders give away large amounts of goods to their followers, strengthening group relations. By sacrificing accumulated wealth, a leader gained a position of honor. Southeast Asia Theravada Buddhist Feasts of Merit, similar to the potlatch except that such feasts involve many sponsors of all types, and continue to this day mainly before and after Rainy Seasons rather than chiefly in winter. Offerings to a deity, spirit, intercessionary saint or similar entities. A political machine, in which a politician gives patronage and favors in expectation of future political support and/or as a reward for past support. A "favor network" within a company. A family, in which each generation pays for the education of the next: this is an example where the gift creates an implicit obligation to give a gift to a third party, rather than to the giver. Open source computer software development. One of the possible benefits of a gift economy (which it has in common with some planned economies) is that it can provide for the needs of some who have no current means with which to reciprocate. For example, if some in a society are so poor as to have nothing material to barter and no goods or money to bring to market, they can still receive charity if sufficient resources exist. Similarly, in the vast majority of societies, parents support their children at least in early childhood (and, in some societies, into adolescence and adulthood) without any explicit negotiation of what is expected in exchange. Kula, also known as the Kula exchange or Kula ring, is a ceremonial exchange system conducted in the Milne Bay Province of Papua New Guinea. It involves a complex system of visits and exchanges and was first described in the west by anthropologist Bronislaw Malinowski in 1922. The Kula gifts are of two types and are not in themselves remarkably valuable. 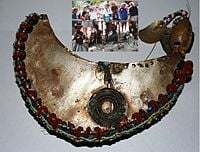 One consists of shell-disc necklaces (veigun or Soulava) that are traded to the north (circling the ring in clockwise direction) and the other are shell armbands (Mwali) that are traded in the southern direction (circling counter-clockwise). Mwali was given with the right hand, the Soulava given with the left hand, first between villages then from island to island. If the opening gift was an armband, then the closing gift must be a necklace and vice versa. These are traded purely for purposes of enhancing mutual trust relationships, securing trade, and enhancing one's social status and prestige. Koha is a New Zealand Māori custom which can be translated as "gift," "donation," or "remuneration." It is an example of reciprocity which is a common feature of much Māori tradition, and often involves the giving of gifts by visitors to a host marae. Traditionally this has often taken the form of food although taonga (treasured possessions) are also sometimes offered as koha. In modern times money is most commonly given to offset the costs of hosting a hui (Māori assembly). For the benefit of non-Māori unfamiliar with the custom, some marae may suggest a particular amount to be given as koha although this amount may not meet the actual costs associated with the meeting. In wider current New Zealand society the term has a broader meaning more closely associated with the English term donation. When you are invited to a "free" event you may be asked for 'koha', usually in the form of a "gold coin donation" ($1 or $2 - this being the color of these coins - rather than smaller silver coin denominations). Sepik Coast exchange is the method of social networking and alliance in the Sepik Coast area of Papua New Guinea. Families living along the Sepik Coast in northern Papua New Guinea form alliances with families in other communities. Depending on the importance and status of the family, it can have anywhere between 5 and 75 contacts in its social network. When they travel to another town, they bring gifts to their contact family, and that family will house and care for them. Gifts are reciprocated when given or later when families return the visit. Common gifts are sago, tobacco, baskets, wooden bowls, and other similar items. The recipient does not specify which type of gift they would like to receive, but as a result of the vast quantity of exchanges taking place, the needs of participants are generally met. In this exchange culture of the Sepik Coast, the significant expectations are hospitality, gift giving, and reciprocation from friends in different villages. Alliances are passed along and preserved through many generations, because fathers bring their sons on their trips and families honor an association, no matter how long it has been since the last gift exchange. The Moka is a system of exchange in the Mount Hagen area of Papua New Guinea. It is a complex system of exchange that relies heavily on pigs as currency for status in the community. The Moka encompasses a large area around Mount Hagen and involves large-scale exchanges of pigs between "big-men." A big-man is the most influential man in a tribe. He lacks coercive authority and his position is informal and often unstable. It is achieved through recognition (by skill, wisdom, or material possessions) and is not inherited. A big-man is recognized as "performing most capably in social, political, economic and ceremonial activities." His function was not to command, but to influence his society through his example. He was expected to act as a negotiator with neighboring groups, and to periodically redistribute food (generally produced by his wives). In this sense, he was seen as ensuring the well-being of his community. Moka is based on competition between big-men; at any given time in the process, there is inequality between the players. Big-men are able to exchange huge numbers of pigs at the Moka by having a large support group of men who have received small gifts of sweet potatoes or pigs in exchange for one or two pigs. The pigs accumulate from many sources and when there are enough, they are given to a rival big-man. That big-man uses them to repay what he owes to his supporters (in addition to using many of them as a feast at the Moka) and has a few years to breed and amass pigs enough to equal and outdo the previous gift. In this fashion the exchange is continued, each exceeding the other in turn. He could also use the gift to make Moka to a third big-man, guaranteeing superiority over him for a time. The Moka is the vehicle by which big-men obtain their status and is a complicated game of zero-sum exchanges of material culture that serves to elevate prestige. A big-man can have several Moka partners with whom he carries on exchanges: some on a larger scale than others. He must be constantly thinking about people he owes and people who owe him, the timing of the next Moka, and how he might subtly undermine another big-man to gain more prestige. The Moka depends on the big-man, who is dependent upon his social network of supporters. The Moka continues until one of the big-men cannot reciprocate and increase the gift and his inferiority to the other is established. Theoretically, Moka exchanges continue for an indefinite amount of time and an outcome is never reached. At any time, one of the more important members of a big-man’s social network may decide that he is better off supporting a rival big-man and could switch sides, so to speak, and undermine his former big-man while strengthening his rival. Thus, there is always uncertainty involved in the Moka. The ceremonial feast called a potlatch, practiced among a diverse group of Northwest Coast Indians as an integral part of indigenous culture, had numerous social implications. The Kwakiutl, of the Canadian Pacific Northwest, are the main group that still practices the potlatch custom. Although there were variants in the external form of the ceremony as conducted by each tribe, the general form was that of a feast in which gifts were distributed. The size of the gathering reflected the social status of the host, and the nature of the gifts given depended on the status of the recipients. Potlatches were generally held to commemorate significant events in the life of the host, such as marriage, birth of a child, death, or the assumption of a new social position. Potlatches could also be conducted for apparently trivial reasons, because the true reason was to validate the host's social status. ↑ Tourism New Zealand (2007) "Koha ~ Gift" Retrieved September 29, 2007. Strathern, Andrew. 1971. The Rope of Moka. Cambridge: Cambridge University Press. Massim: Trobriand Islands and Kula exchange. This page was last modified on 21 June 2017, at 19:35.